Get the facts on SalesPad Cloud. Whether you’ve outgrown the capabilities QuickBooks Online or you’re looking for a path to the cloud, SalesPad Cloud is the answer for your growing wholesale distribution company or retail chain. Bringing it all together in one beautiful, intuitive interface, SalesPad Cloud allows you to focus on what matters most to you — your products, your employees, and your business. 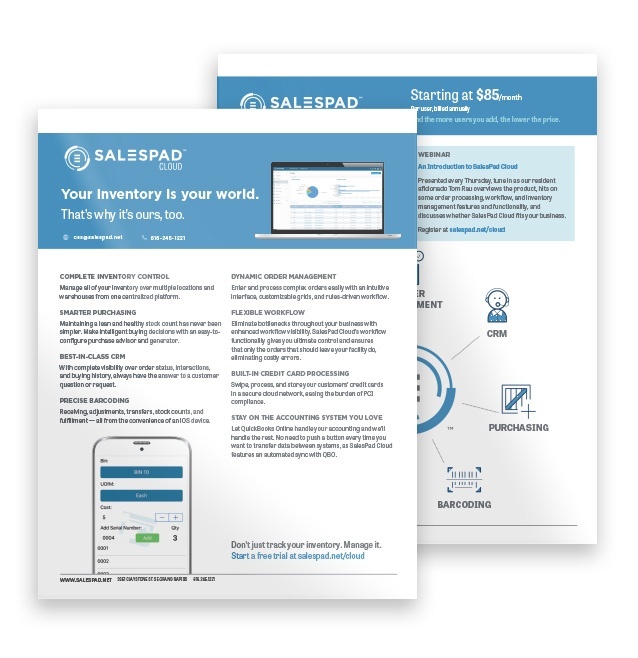 Download the SalesPad Cloud fact sheet and get an overview of enterprise capabilities like workflow, inventory management, and order processing offered in our secure cloud platform. Fill out the form above to begin your download and learn all there is to know about SalesPad Cloud.